Everyone knows that excess sugar in your diet is bad for you. But would you go as far to consider sugar a poisonous drug? People often forget that there are many different types of sugar, and surprisingly, fructose is by far the most detrimental to your health. I would argue that excess fructose could be classified as chronically toxic (1), meaning that a small, infrequent overdose of fructose likely won’t cause problems, but a lifetime of fructose in excess can cause a variety of diseases. Well, to answer that question, we need to get into a little bit of chemistry. There is glucose, which is used by every cell in the body. And then there is fructose, which is processed almost entirely by your liver. The main transporter for fructose is called GLUT5. There are many parallels between fructose and alcohol, which everyone recognizes as toxic (2). It strikes me as continuously odd that fructose remains largely unrecognized as a potential toxin, even though nonalcoholic fatty liver disease, sugar consumption and diabetes rates continue to climb, fructose is largely ignored. The problem with fructose is that it does not lend the same satiety signal to your brain, meaning that you don’t realize you just ingested all the calories that you actually did. 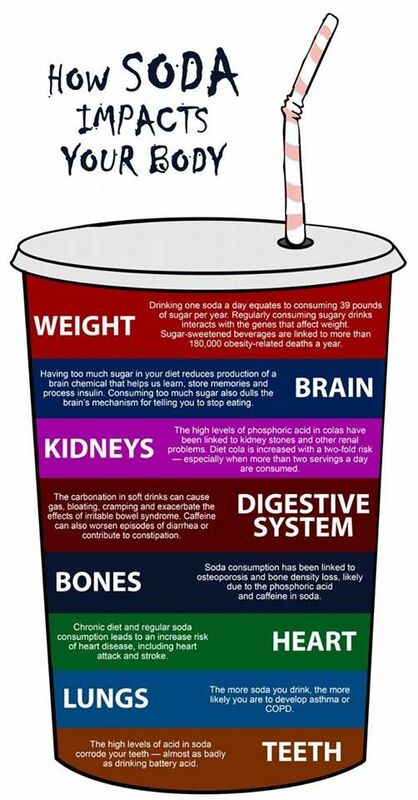 The best example of this is seen in a can of soda, which typically contains 70g (!) of sugar. What’s more disturbing is that companies flat out LIE about the amount of fructose in their products (4). Right on the labels! Drinks advertised as containing no high fructose corn syrup sometimes contain MORE fructose than the drinks that DID list it on the label. And if you think fructose is only a problem in soda, think again. The main reason why we eat so much of it is because fructose is the sweetest tasting of all sugars. Its sweet taste can be found in foods like honey, bananas, apples, dates and many other fruits and fruit juices. Fructose is most widely known for its use in high fructose corn syrup, made from a mixture of glucose and fructose. If you think this blend is only found in desserts and drinks, think again! Just about everything in our food supply contains high fructose corn syrup, from deli meats and condiments to bread and cereal. Because of its biochemistry, high fructose corn syrup has become a real threat to maintaining a healthy lifestyle. Since its addition to our foods in the 1970s, our diet has changed from more traditional meals of meat and vegetables to ones based on refined carbohydrates. Our genome was arguably not set up for this. Over time, we likely ate a low-ish carbohydrate diet, at times likely even ketogenic, when food wasn’t available for periods of time. 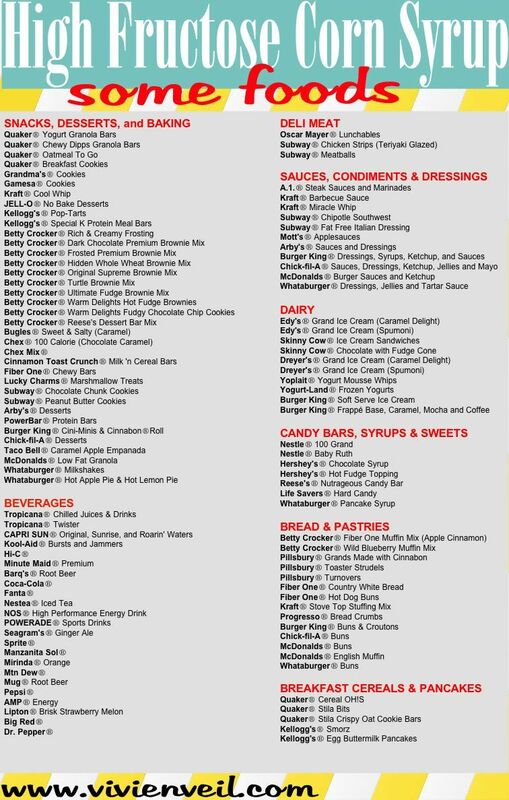 Now we have convenience stores on every corner, offering liquid sugar, high carbohydrate “franken-foods” and high fat, high sugar foods. 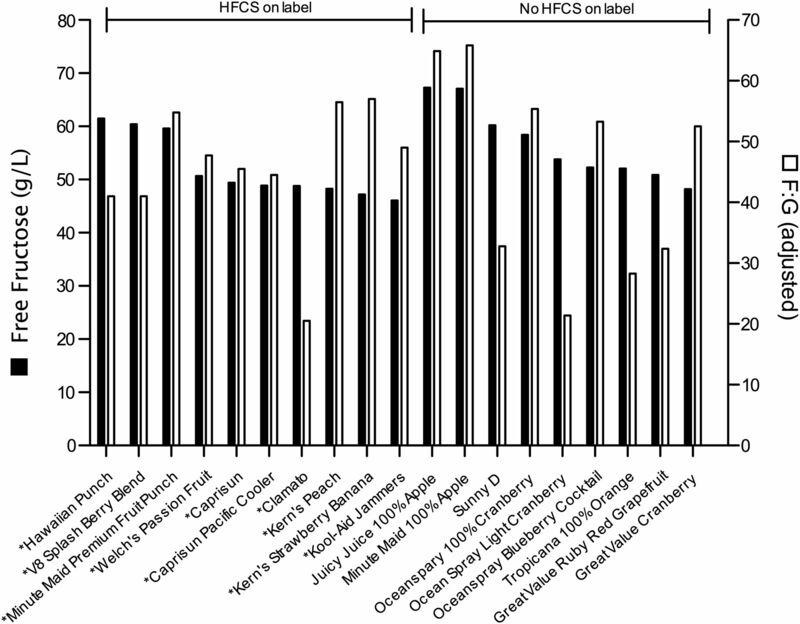 Unsurprisingly, fructose consumption has been correlated with cancer (5). While correlation does not necessarily equal causation, there are many causative problems with fructose consumption. The cross-linking of proteins is one problem (6). As this process occurs, diseases related to aging become inevitable. High fructose consumption can result in a plethora of age-related diseases, like atherosclerosis, hypertension, erectile dysfunction, kidney disease, stiffness of joints and skin, arthritis, cataracts, retinopathy, neuropathy, Alzheimer’s and many, many more. 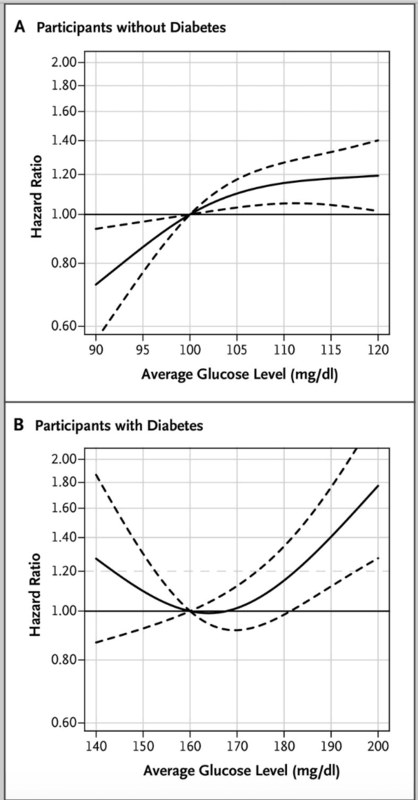 Here is a graph, showing exactly how high levels of sugar correlate with dementia. That’s right…lots of fructose may lead directly to dementia. Have I scared you off of that sugar water you may be consuming? In 2010, it was very clearly stated by scientific researchers that “in the amounts currently consumed, fructose is hazardous to the cardiometabolic health of many children, adolescents and adults.” In those 4 years, the data has only gotten worse. 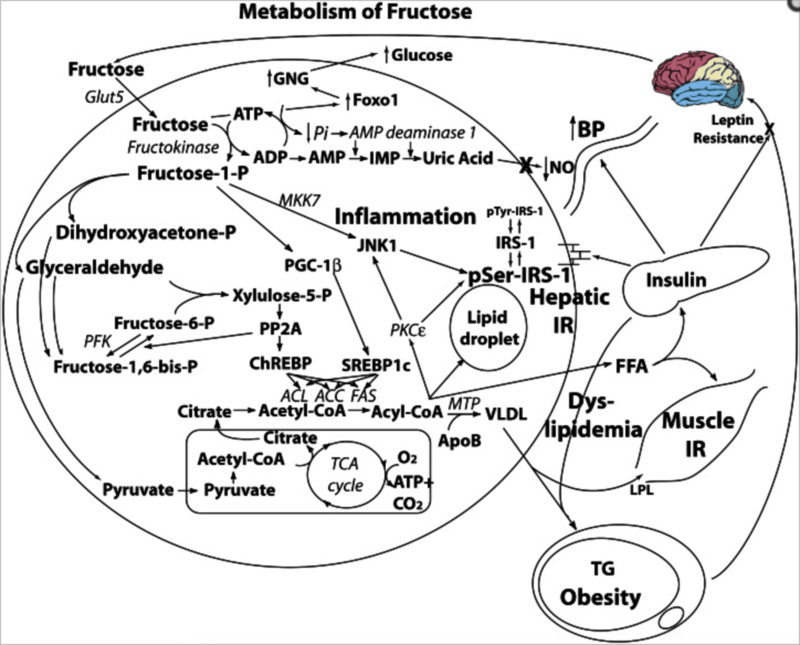 Here’s a schematic that shows EXACTLY how fructose factors in to our now-diseased population. Stopping this cycle is easiest when you simply limit your dietary amount of fructose. 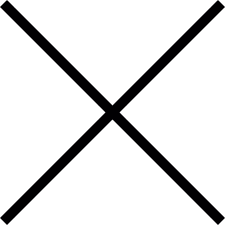 All other possible interventions are more complicated, or impossible. It is quite a simple solution, but the rewarding nature of food makes it hard for some individuals to stop. The liver-damaging effects of fructose are also well-documented. Hepatic dysfunction is not desirable, and nonalcoholic fatty liver disease (NAFLD) in children is rising. NAFLD is directly linked to fructose consumption, either by ingestion of soda or fruit juice (7). 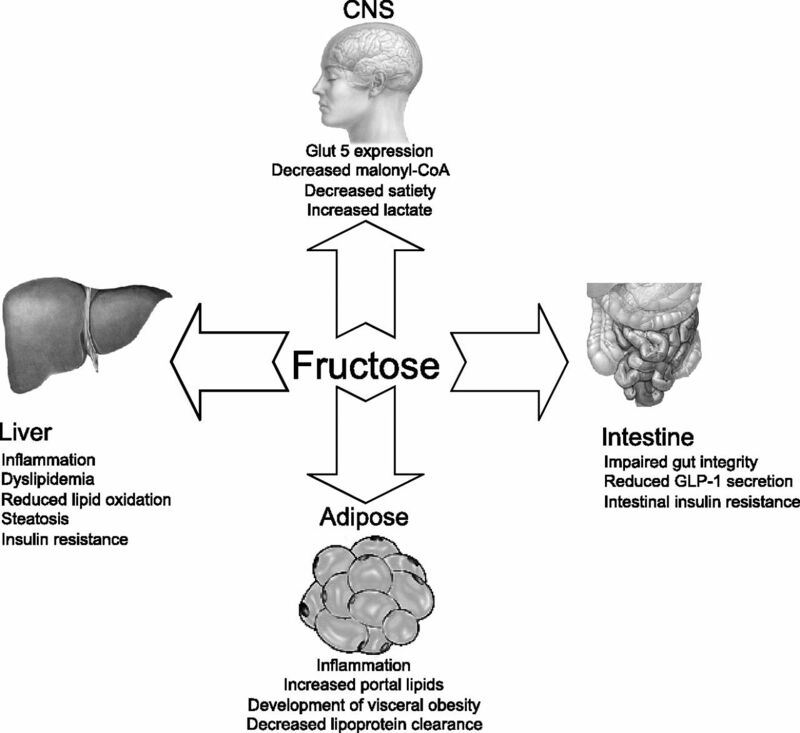 Fructose is somewhat similar to grains in that it is largely useless for the body to consume the substance. However, it is actually worse than grains, because fructose in large amounts becomes toxic. Sadly, I see this misunderstood in the Paleo community all the time. Just because it is Paleo doesn’t mean you should consume 10 pieces of fruit per day. The same thing happens with nuts. People tend to overdose on these items, when in reality, a balanced, well-rounded diet would work much better. So, have I convinced you to stay away from fructose yet? Does it make you feel good that fructose is one of the most likely suspects for the current $245 billion per year that we spend on diabetes? I wouldn’t imagine so. Sugar, mainly fructose, is also quite heavily marketed towards children (8). We need to stop that practice, immediately, if we have any hope for a healthy future. As Dr. Robert Lustig has stated, fructose is simply alcohol “without the buzz” (9). Nearly everything else about the substance is the same. Fructose does not generate an insulin response, which is part of why it’s so dangerous. When we don’t know we’ve eaten something, such as in the case of the body’s hormonal response to fructose, we run the increased risk of overconsumption. Hormonally, fructose causes reductions in insulin, a reduction in leptin (so you feel less full), and increases the expression of the hormone ghrelin (so you feel hungrier). Not a good combination. 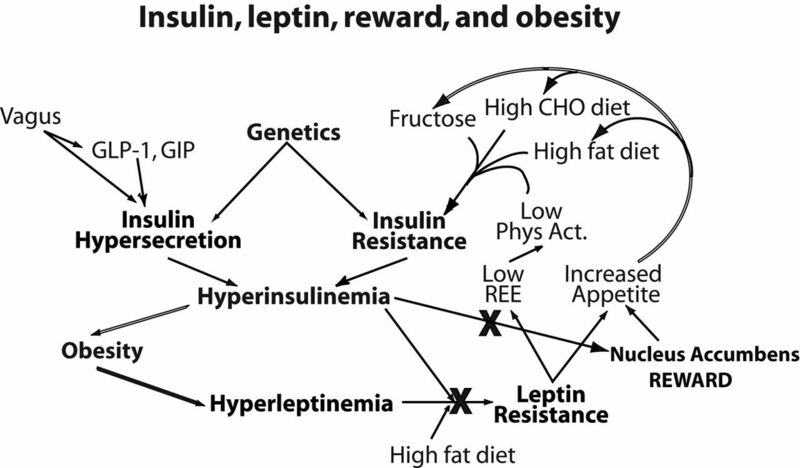 Here we see the leptin resistance, dyslipidemia, increased triglycerides, muscle insulin resistance, and other negative effects all from the biochemistry of fructose ingestion. Fructose offers no benefits and only negative consequences, but it’s difficult to limit our intake of the stuff. That’s because its sweetness, which evolutionarily meant nutrient-rich foods, is hard for humans to simply consume in moderation. What are your views on fructose? Do you include it in your diet? Do you eat lots of fruit? Let me know in the comments! For 200+ healthy paleo recipes low in fructose, toxic artificial ingredients — but full of taste and nutrition, make sure to check out our Paleohacks Cookbook Bundle Here!